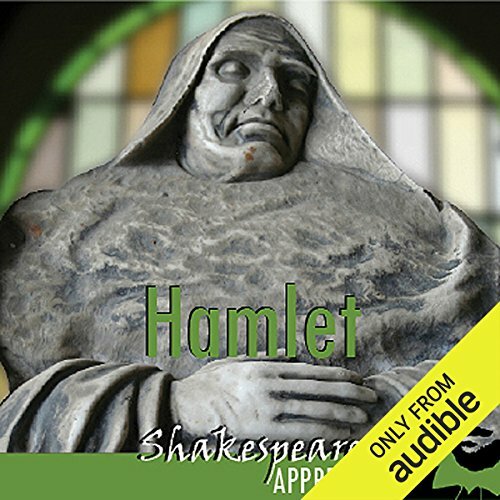 William Shakespeare’s Hamlet is reimagined and brought back to life for the modern audience in the brilliant audiobook Hamlet: Shakespeare Appreciated, composed by Simon Potter, Phil and Jools Viner with a commendable narration by Joan Walker, Stephen Elder and Paul Clayton. Part of the Shakespeare Appreciated collection, this unabridged reading of Shakespeare’s famous play is gripping. Listeners have the option to download with or without commentary. The commentary is recommended as it gives a full historical background to the play and Shakespeare himself. This is truly a brilliant experience of one of the most notable plays ever written. Available now from Audible. This is the second "Shakespeare Appreciated" recording I have listened to. The first was "Julius Caesar". The performance was just as good but the commentary was almost non-existent. Pretty much "Hamlet enters..." or "Hamlet exits...” If you have no concern for the commentary you will enjoy this. This is an excellent narration of Hamlet. The performance keeps the story moving. The version with commentary gives great insight into the play. I enjoyed listening to both versions of the play. Great for students reading Hamlet for the first time as well as for those who have read it many times over. A must buy for your collection. While I have loved the poetry of Hamlet, it wasn't until I listened to this performance of the play - powerfully well done - with commentary that I was able to transcend 21st century culture and immerse myself in the depths of Hamlet. The program unveiled my brain to the beauty which had been previously obscure. Let's admit it, Shakespeare is daunting! I have a goal to read all of the plays, and then perhaps the sonnets, etc., but sometimes I don't know where to start. When I found this audio book that includes a commentary, I snapped it up. I could listen to and enjoy the fabulous play, but when I got lost or just didn't understand something, the commentator was there to help. She helped me understand word usage of the time, symbolism, and other useful things that are jam-packed in this play and make it the classic that it is. For me it was perfect. You can listen without the commentary as well, for people who would rather not have those comments going on but want to hear some great readers performing this play. I will definitely pick up other titles in this series. Listen to the version with commentary, then the one without, for a fantastic experience, as you will then understand every utterance! This would have been time-consuming in print, but it goes by quickly with Audible. Thanks for a great series. The actors are very professional and do the master justice. This could be helpful for an introductory student of Shakespeare and "Hamlet". There is some dramatization (carefully and rightfully described as being "speculative", as are all details of Shakespeare's life and literary motives) of Shakespeare's possible thinking when he wrote "Hamlet". Then there's a complete version of the play, done very well, but with extensive commentary. Anyone interested in getting to know Shakespeare but unfamiliar with the language of the time could find all this interruption helpful. My reservation is that it can also be somewhat confusing. I believe this might be better done (and perhaps has been done) in a video format. This is a noble effort, and I hope it might bring more people to an appreciation of "Hamlet". I would recommend this book to any students who may be studying Hamlet, both for the insight into how it is performed and the integrated commentary which fills in an enormous amount of background detail without slowing down the story too much. The most outstanding feature was the research and insight that went into the commentary. This is not a cheap cash in on a famous title. The book is very dense and may give you a bit of indigestion if listened to quickly. That said, I was in a hurry and used the 2x speed on the iPhone and was still able to follow it well. An important note: if you just want to listen to the dramatized reading of the play, just play Part 2. It doesn't have any commentary. Great for a Shakespeare beginner! I have always been afraid of Shakespeare because the language and meanings are so different. I didn't think I would be able to understand what the "true" meaning was. This audio was set up perfectly. The first part the narrator interrupts and explains the back story or the particular meaning of a phrase. Once I listened to that I was able to listen to just the dramatized play and I got so much more out of it than I would have listening on my own. Plays are a visual thing for us, even for those who went to "hear a play" back in Shakespeare's time - they at least looked at people occasionally to sort everyone out (if they were paying attention). Reading a play is easier as well compared to having to listen to an audio version. I was preparing to direct Hamlet and wanted to drown myself in the play as much as possibel so I got this to listen to while in the car. Wonderful attempt at performing the play tho as a fan of Shakespeare, the commentary did get in the way a bit. It's great for beginners and those who have issues with Shakespeare's language! I’ve enjoyed all the Shakespeare Appreciated productions I’ve listened to thus far. The narration is a wonderful aid for understanding the play! I then listen to version without the narration/explanation to let it really sink in!